The Western media immediately latched onto the statement, presenting it as the position of the regional body and paying little attention to its source. Although the statement was issued in the name of SADC, it in fact came from Zambia’s President Edgar Lungu, who chairs the regional body’s politics, defence and security division. Until recently, I believed, like many people, that the statement was a product of regional consensus reached after intense deliberations. However, two well-placed SADC senior leaders familiar with the development told me in separate meetings recently that other regional leaders did not share Lungu’s position. As one of them put it, ‘We do not know where that statement came from because there was no discussion among regional leaders and what was communicated was not the position of SADC. It was President Lungu’s view and he used his position as Chairperson of the SADC Organ on Politics, Defence and Security to commit the whole bloc to what was, at best, Zambia’s position.’ All things considered, it is even likely that the supposed author of the statement, Lungu, knew little of the statement. First, at the time of its release, he was undergoing a reportedly prolongedmedical review at a hospital in South Africa, rendering his participation in intense meetings doubtful. Second, Lungu has been a fierce opponent of unity governments and it is implausible that he would advocate a form of political settlement that he has previously done so much to oppose,including at home. Similarly, partisan and sectional considerations appear to havebeen at the heart of the AU’s response to Congo’s election. This prospect assumes importance when one considers the fact that Paul Kagame, whose government has had a longstanding interest in who leads Congo, currently leads the continental body. After the publication of the election results, Kagame, using his position as AU chairperson, very rapidly called for a meeting that raised grave doubts about the poll outcome, demanded for a recount of the vote tally, and pledged to dispatch a delegation to Congo to resolve the post-election deadlock. Like Lungu tried to do with SADC, Kagame masked his interest using his AU position. The Rwandan leader has a notorious history of intervention in Congo. 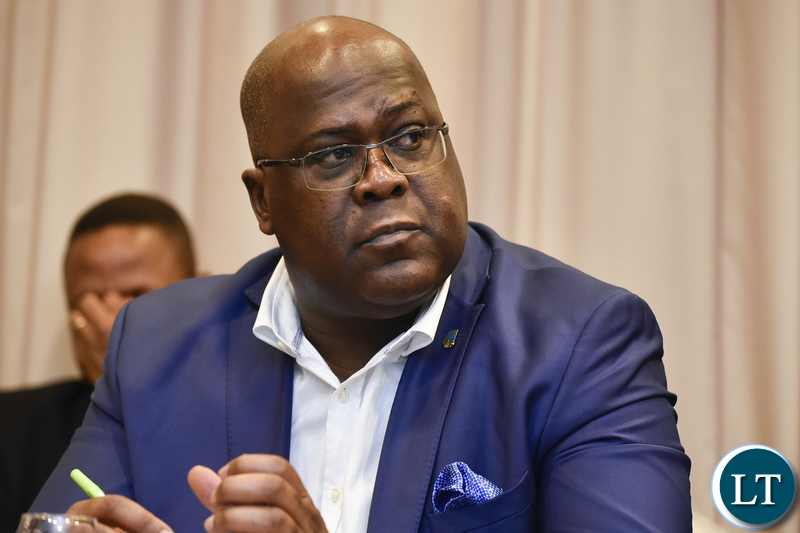 It was his forces that brought Laurent Kabila, Joseph’s father, to power. Since falling out with the younger Kabila,Rwandese backed forces have caused chaos in the eastern part of the country. It is therefore pertinent to note how Kagame covertly came out in support of the opposition candidateFayulu. Kagame and his ilk are of course only junior partners in the looting of Congo. They may have the boots on the ground and be more ready to intervene militarily but they certainly do not receive the largest share of the spoils. It is the same motivation to return a moderately stable Congo, stable enough that is, to facilitate continued plunder, that motivates the concerns of Western nations and multinationals. Congo from inception has been run by outside powers. Mobutu Sese Seko, the military dictator who ruled Congo from 1965 to 1997, was in power for such a long time only because he received thebacking of Western governments. As long as Mobutu allowed Western firms to loot the riches of Congo, Western governments never took issue with his dictatorship and lack of commitment to genuine democracy. Similarly, Laurent Kabila, who overthrew Mobutu in May 1997, was never committed to any democratic standards but he received the backing of Western countries for as long as he remained faithful to Western exploitation of Congo’s wealth. The point is that Western countries, like SADC ones, have had no problems in recognising fraudulent elections anywhere on the continent as long as the new leader is one they see as better placed to serve their interests. The response of Western governments to the outcome of Congo’s recent election should be understood in this context: the search for a pliant leader who would remainfaithful to facilitating Western interests in the Congo. As usual. African men know how to write long articles from education they acquired through Europeans. Continent still getting darker by the day while they hide behind their useless PhD’s. Watch their fellow cowards applaud the impotency! I really like your analysis. We waste so much of our time on dark conspiracy theories to explain our failures. The Asian tigers economies had developed through the same “western looters” but Africa has remained stuck, and we continue with the same arguments. In Zambia, we had KK for 27 years, and I would be interested to know the powers behind him that were “looting” our resources, thus leaving us undeveloped. Let us move away from useless theories please. Cambridge and Oxford’s PhD’s were not the ones who led out in the Industrial Revolution. Common people did – those who were struggling for survival. Education and thinking are not synonyms. They rarely co-exist. continued instead of always highlighting challenges. We have the knowledge let us change our lives and those of others. DRC SHOULD BE DIVIDED INTO TWO OR THREE COUNTRIES FOR EASY ADMINISTRATION. THE RICHEST COUNTRY IN THE WORLD WITH POOREST CITIZEN. Western countries (and eastern ones) just take advantage of the seemingly eternal stupidity of most African leadership. For what this continent is worth, lets choose to be recolonised. Negotiate recolonisation packages that give us least struggle for better lives. We are a lost cause. Anyone familiar with the elections in Congo, knows that Fayulu won the elections. There is no doubt about that. That is why lots of leaders did not want to attend the inauguration ceremony. In a way, they thought this would legitimise illegitimacy. Yes, Fayulu won. But that was not the politics. The politics was to get Joseph Kabila out through the back door. They played it smart – making it look as if an opposition candidate won, when it was all fake. At any rate, it was half a slice, which was better than none. Why to divide DRC?Let us give first lozi their republic. Yes Donald Trump didn’t waste time in recognizing Tshisekedi because he didn’t want to disrupt the looting. Our educational system is based on memorizing junk, and getting awarded for the ability to regurgitate it. It for that reason that we are less of thinkers and more of theorists. We are trained to sing, but not to write the script for the song to be sung, much less to produce the notes for the music. The white man has made sure that is our type of education.